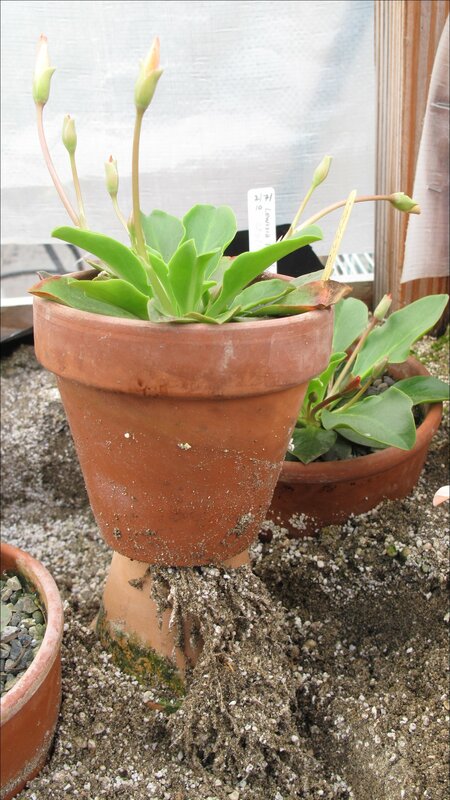 It doesn’t take much to get me to sit down and write a blog post about my favorite Lewisia. For weeks now I’ve been anticipating the first blooms from plants I started three years ago from seed. For years, Tweedy’s Bitteroot was considered part of the small western North American genus Lewisia. These days the researchers and scientists have been shifting it around the taxonomic landscape, first moving to a different Family (out of Portulacaceae and into Montiaceae), grouping it with Claytonia and the Montia genuses. Though some of these scholars first assigned it to the genus Cistanthe, as far as I can tell, they’re making the case for a new genus called Lewisiopsis (probably a sop to those of us who see it rightly belonging with the other bitterroots rather than plants with the common name of “pussypaws!”). 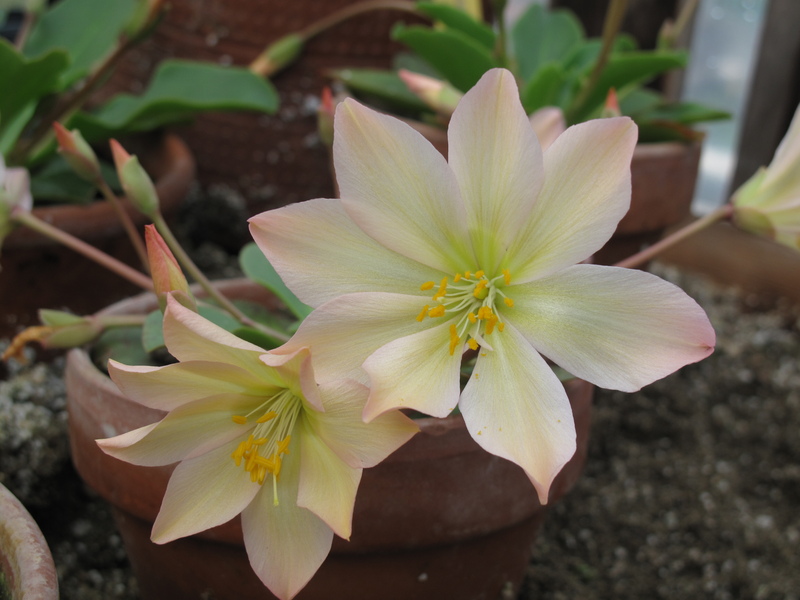 The resulting genus of Lewisiopsis now apparently contains only the former Lewisia ‘tweedyi’. So should any of this be of the slightest concern to rock gardeners and plant lovers? Probably not, but rest assured I will never refer to this plant as Tweedy’s pussypaws (ugh). One thing is certain, Frank Tweedy — a topographic engineer and plant collector for the USGS — is credited for putting this northwest native on the horticultural map in 1882, when climbed Mt. Stuart near Wenatchee, Washington. For more on Frank Tweedy’s horticultural achievements, read this post. So if you’ve read this far, check out this picture of tweddyi’s long root system, which ensures this plant its longevity and adaptability to the rocky scree-like soils of its home in the mountains. Imagine coming across this little beauty while hiking around Icicle Creek Ridge near Leavenworth. Although I have yet to see it in the wild, this is the first time I can claim to have watched it go from seedling to flower. For more on the history of Tweedy’s Bitterroot, see my previous post. 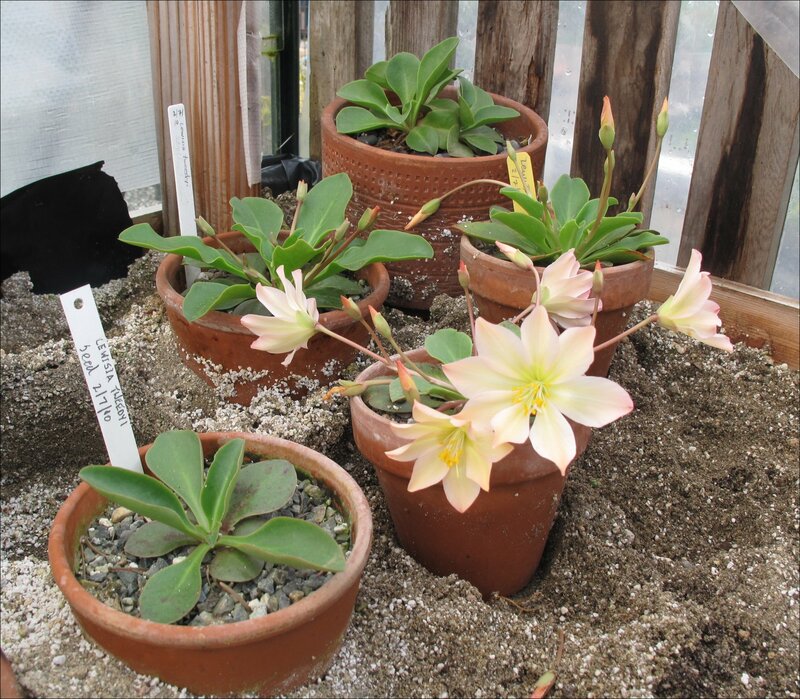 This entry was posted in Alpines, Pacific Northwest Natives, Plant People and tagged Frank Tweedy, Lewisia, Lewisiopsis, Portulacaceae, Tweedy's Bitteroot, Wenatchee WA by Bart Arenson. Bookmark the permalink. Thanks so much. It seems to me there’s always a bit of a learning curve with any blogging platform, so trying out WordPress for free seems to me a good way to test it out. Good luck! Thanks Denny for the heads up and the compliment. I gave up using IE a couple of years ago, but I should test how the blog is rendered on IE. I use Firefox and I also check how it looks on Safari for iPhone, which seems OK. WordPress.com is supposed to be OK for Safari version on mobile devices and I do think that’s OK. Were you viewing on a mobile device or a MAC? I don’t have a MAC OS to test on. I appreciate the feedback. I’ll check the WordPress.com support pages and try and fix overlapping issues. BTW, I’ve been working on building a greenhouse and haven’t had a chance to post much, but now that I’m almost done with the greenhouse I should be able to get some pictures of all the plants blooming their heads off. The weather has been summer-like already, though often here in the Pacific Northwest we don’t get real summer weather until after July 4th.